Andrew McFadden wasn't sure what to do when he found out he had a rare and aggressive form of cancer. But working together through a unique partnership, his physicians helped him develop a treatment plan and find a way to move forward. Andrew McFadden has always been a fighter. He spent 22 years in the U.S. Army with one tour in Iraq. He battled a rare type of cancer in his chest called thymic carcinoma that, after surgery and radiation, remained in remission for more than a decade. But then in April 2017, as Andrew was getting ready to go to St. Stephen's Baptist Church in Marion, South Carolina, where he's a pastor, he noticed a lump the size of an egg in his neck. He was evaluated at a local emergency department and told to see his primary care physician as soon as possible. His doctor referred him to a surgeon who did a biopsy and diagnosed neuroendocrine cancer. A patient of Carolinas Hospital System in Florence, South Carolina, part of the Mayo Clinic Care Network, Andrew had a consult with oncologist Ziad Skaff, M.D., in May 2017. Imaging tests revealed a mass in his neck and another near his ribs and diaphragm. "These tumors are a rare and aggressive cancer that has a poor prognosis," Dr. Skaff says. "I told him the cancer — a relapse of the first cancer that had mutated — would spread. He has a 9-year-old daughter, and because he said he felt fine and had no symptoms, I was very concerned that he wouldn't pursue chemotherapy." Andrew admits he was in denial. He couldn't believe his cancer had come back. The rare nature and uncertain behavior of the tumor further complicated his treatment decisions. "Cancer is such a complex disease, and I felt a second opinion might help Mr. McFadden accept the importance of getting treatment," Dr. Skaff says. Because Carolinas Hospital System is a member of the Mayo Clinic Care Network, which gives independent organizations special access to Mayo Clinic resources, Dr. Skaff knew that he could connect with a Mayo specialist for a quick, convenient review of the case at no cost to his patient. "I told Andrew about our relationship with Mayo Clinic," Dr. Skaff says. "He could get a second opinion from a doctor who treats this rare cancer each and every day." Dr. Skaff requested an eConsult with Mayo Clinic oncologist Pashtoon Kasi, M.D., M.B.B.S., who promptly reviewed Andrew's case and responded directly to Dr. Skaff about the cancer and treatment options. A pathology review, which is part of the consult, confirmed the diagnosis. After Dr. Skaff discussed the results of the eConsult with his patient, Andrew decided to go to Mayo Clinic's Florida campus to meet with Dr. Kasi. In addition to being designated by the National Cancer Institute as a comprehensive cancer center and being a world leader in cancer research that offers access to cancer clinical trials, Mayo Clinic also has a special nuclear medicine imaging test for neuroendocrine tumors. 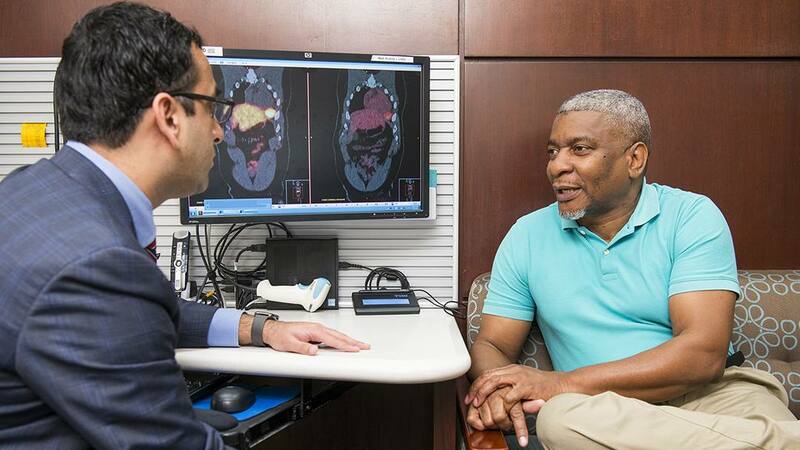 "We have a gallium dotatate scan that can pick masses in the order of millimeters for patients with neuroendocrine tumors, helping us visualize the burden of disease and get a better sense of whether it's spread," Dr. Kasi says. In July 2017, Andrew made the 4 ½ hour drive to Jacksonville, Florida, to meet with Dr. Kasi. "He's very caring. He sat me down and explained everything. He didn't sugarcoat things," Andrew says. "He and Dr. Skaff make a good team. I'm glad Dr. Skaff referred me to Dr. Kasi." After discussion with the Mayo Clinic tumor board, which brings together experts from various specialties to discuss difficult cases, Dr. Kasi recommended five cycles of intravenous chemotherapy. Andrew decided to go ahead with that treatment, motivated in large part by his family, which includes four grown children in addition to his 9-year-old. "Dr. Kasi told me not to stop living and explained that I would be able to continue working," Andrew says. "I felt like I had to do this for my daughter. I want to see her graduate high school and college." Andrew completed the chemotherapy treatment in November and returned to Mayo Clinic for a follow-up scan. It showed that his cancer was not progressing. "After achieving a response, we transitioned him to oral chemo he can do from home, in addition to a monthly shot of medication to control the cancer," Dr. Kasi says. "We were also able to acquire a biopsy of his tumor and subject it to comprehensive tumor-based genetic testing to help identify potential targets for clinical trials and newer therapies, for which he may be eligible in the future," Dr. Kasi adds. "We could offer him individualized medicine through genetic testing at multiple levels." "Coming to Mayo gave me hope. My experience has been phenomenal," Andrew says. "The doctors really spend time with you. I'm glad they did what they did. I probably wouldn't be here today without that treatment." Learn more about neuroendocrine tumors.